Over the next two days, the S&P 500 dropped to 2,347 (the lowest level since May 2017), and thereafter jolted 5% higher, in a single day. How does this rally (up to 174 points in 3 days) fit into the larger picture? The DJIA already reached its ideal down side target (21,700, which is where wave 3 or c equals 1.618 x wave 1 or a). 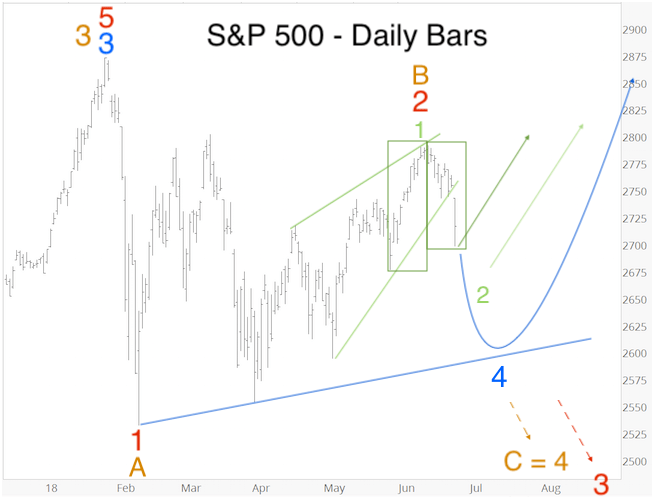 The S&P 500 has not yet reached its ideal down side target (2,269, which is where wave 3 or c equals 1.618 x wave 1 or a). 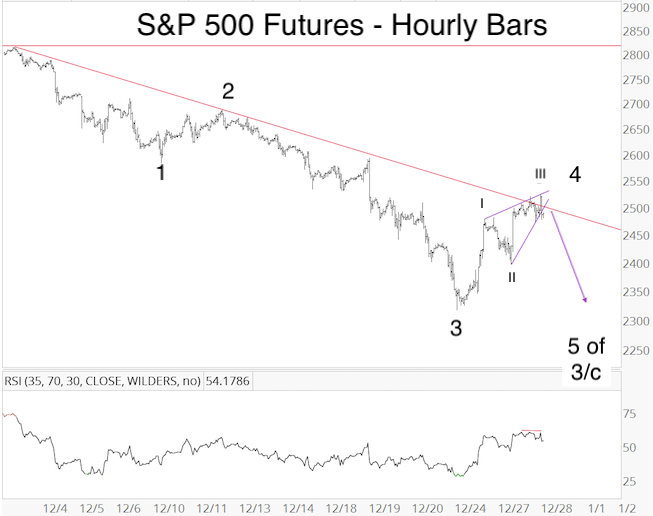 However, the S&P bounced from 2,349, where wave 3 or c equals 1.382 x wave 1 or a). The DJIA already reached it’s down side target, the S&P 500 did not. Sentiment at the December 26 low was extremely compressed, which allows for a larger bounce. How do we resolve the conflict? 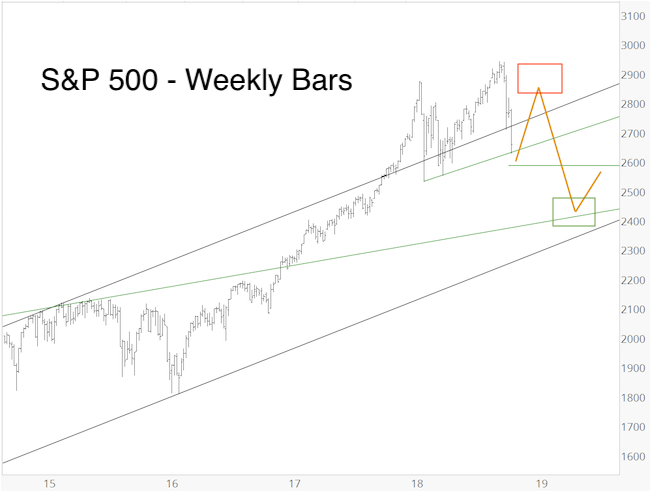 The above path is still in harmony with the outlook published in the October 28, 2018 Profit Radar Report, which projected (yellow lines, chart below) a rally from 2,600 to 2,850 (in October/November) followed by a drop to about 2,400 thereafter. Obviously there has been much flux and volatility, and trading this market comes with a fair amount of risk. But, where there’s risk, there is usually opportunity, and if the S&P follows our path, hits our down side target while over-sold and with bullish divergences, we will want to buy. On June 6, I published a bigger picture S&P 500 outlook. 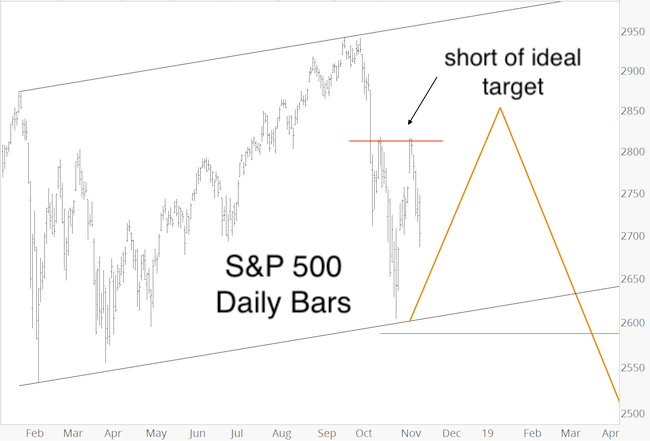 Since this update builds on the June 6 outlook, you may find it helpful to first read the June 6 bigger picture S&P 500 outlook. 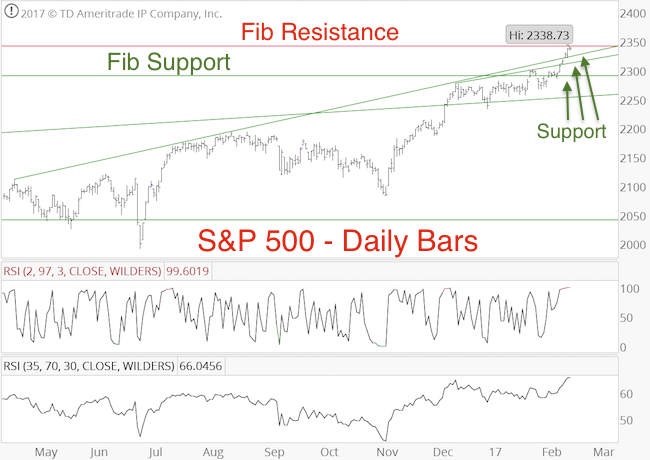 For the past few months we’ve been looking to buy the S&P 500 on dips. We bought the SPDR S&P 500 ETF (SPY) on April 3 and May 31. 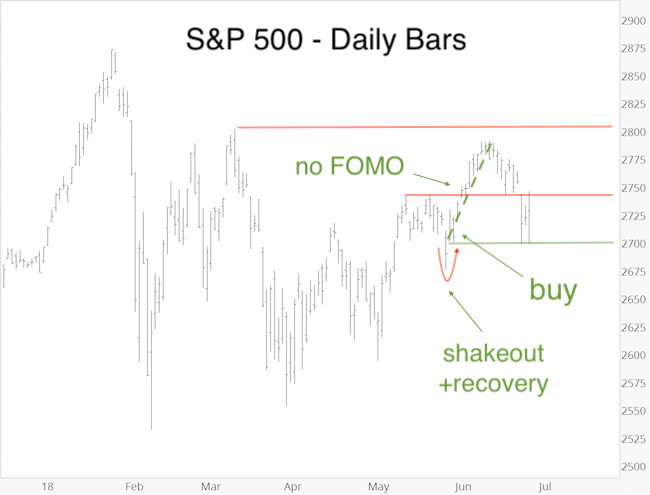 As mentioned in the June 6 outlook, the May 29 shakeout and May 30 recovery (see chart below) increased the odds that either a low is in place or that a more significant rally is developing. Our upside target mentioned in the June 13 PRR was 2,800 – 2,830. 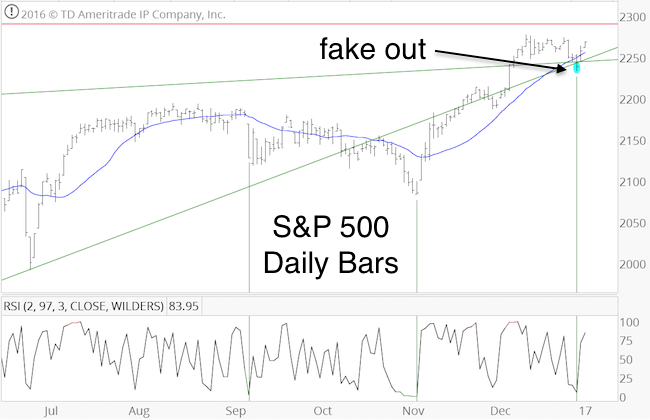 This week support at 2,740 failed, and the S&P swiftly dropped to 2,700. Our SPY sell limit was waiting at 280.50 (S&P 2,810), but SPY reversed before, and Profit Radar Report subscribers got stopped out of SPY at breakeven (271.25, which correlates to 2,710 for the S&P 500). Although the SPY trade was not profitable, it was a success! Why? 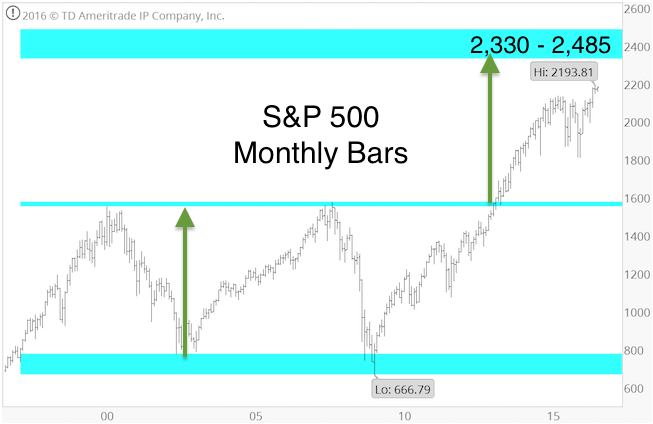 When the S&P 500 rallied more than 100 points from the May 31 low, we did not feel the need to chase price, because we bought near the low, and had skin in the game. Based on various sentiment readings, many investors suffered from FOMO (= fear of missing out) and bought near the high. Back to square one. Pause and reset. The break below 2,740 opens various short-term (and longer-term) possibilities, many of which point to a choppy market. 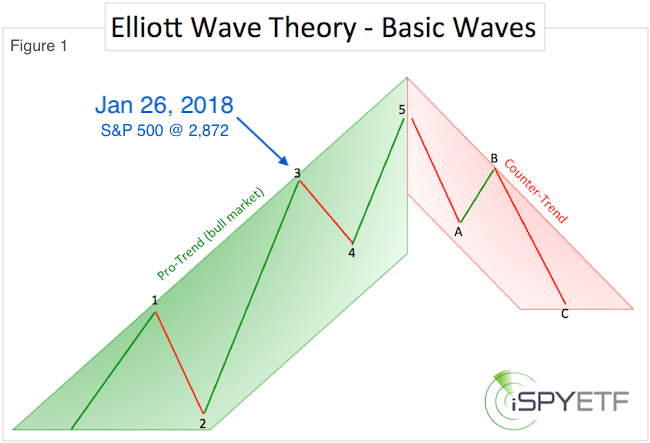 The chart below outlines 5 possible scenarios based on Elliott Wave Theory (the chart below makes more sense when read in context with the bigger picture S&P 500 outlook). They range from immediately bullish (dark green) to short- and long-term bearish (blue, orange and red). 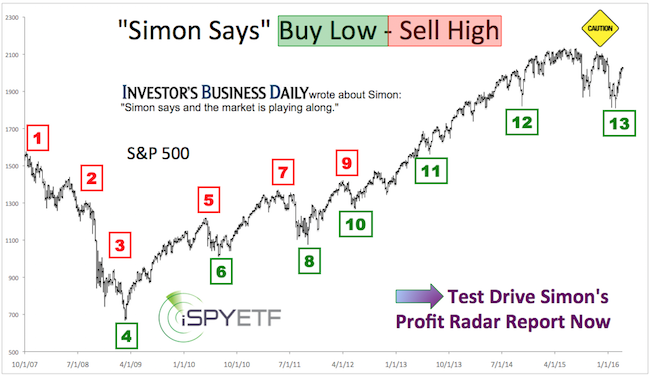 The Profit Radar Report tends to monitor multiple scenarios and cross-checks them against other indicators (technicals, sentiment, liquidity, seasonality/cycles, etc.) to assess each scenarios viability and probability. For example, our trusted liquidity indictor already eliminated 2 of the 5 scenarios illustrated above. In short, we remain in “buy the dip mode,” the question is just how big of a dip we’ll get. For someone who just got stopped out at 2,710, worst case scenario would be a strong, immediate rally (dark green scenario above). From the very beginning, we considered the pullback from the January 26 high to be a temporary correction (wave 4 according to Elliott Wave Theory), not the beginning of a new bear market. 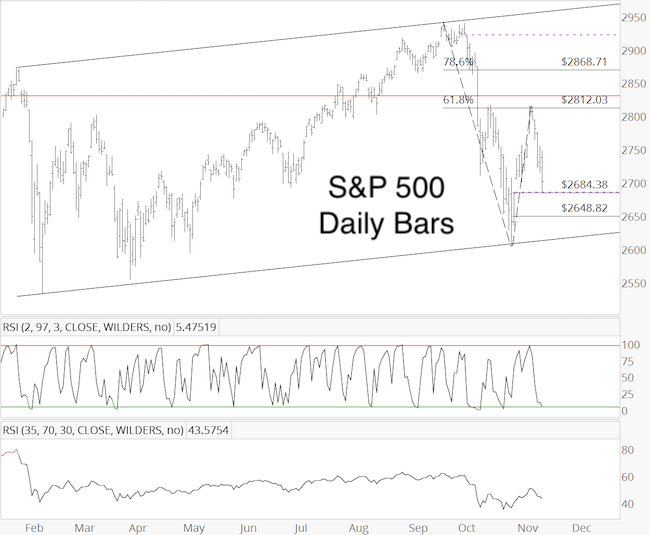 The S&P 500 retraced 38.2% of its preceding wave 3 at 2,536 on February 9. Detailed analysis provided by the Profit Radar Report at the time is available here. Wave 4 corrections come in many shapes and patterns, that’s why they are so difficult to predict. ‘Buy the dip’ is the most effective approach during a wave 4 correction. 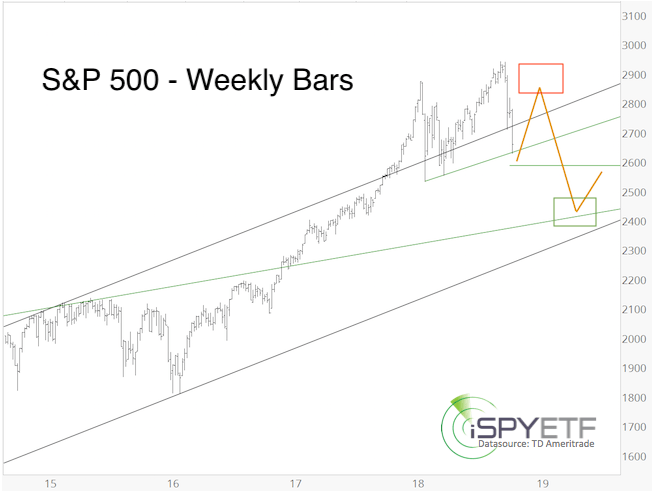 The April 2 Profit Radar Report stated that: “The S&P 500 has met the minimum criteria to consider this correction complete,” and offered specific buy recommendations (free reprint of the Profit Radar Reports surrounding the April 2 low is available here). 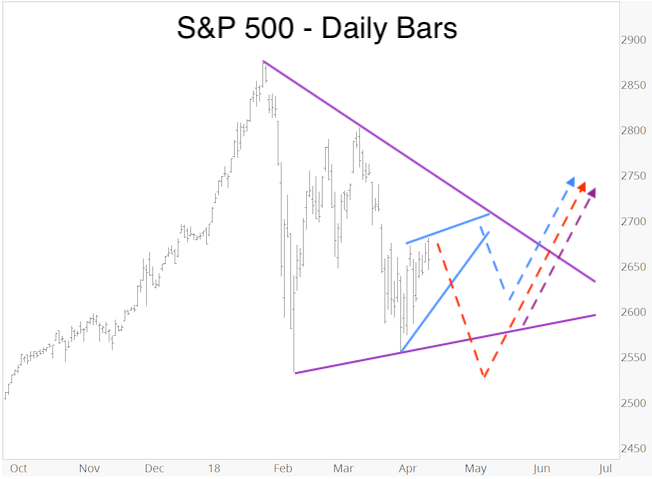 One of the patterns the Profit Radar Report has been tracking since April is the triangle. The chart below, published in the April 15 Profit Radar Report, showed potential paths inside a triangle. The common denominator among all three options was an eventual rally. It looks like the S&P 500 chose the blue path. 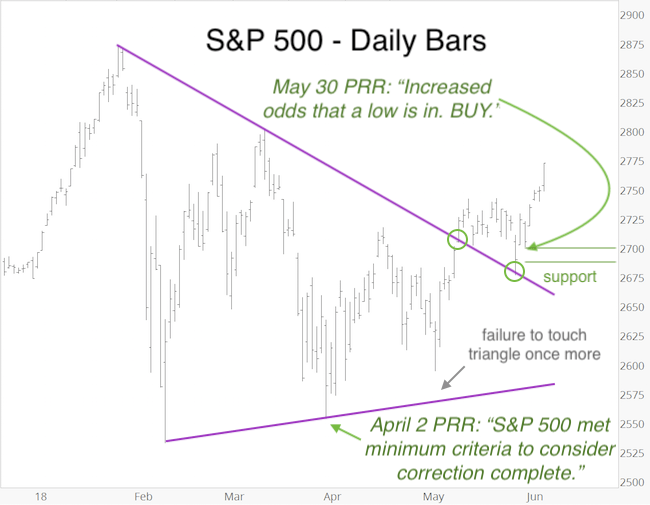 On May 9, the S&P 500 broke above purple triangle resistance, and successfully back-tested the triangle line (now support) on May 29 (green circles). It looks like the S&P 500 completed its wave 4 correction, and is now in the early stages of wave 5 to new all-time highs. At Wednesday’s close, the S&P 500 was near overbought, with the CBOE equity put/call ratio unusually low. This generally translates into a pullback (which may be shallow this time around). Since the S&P still remains in its larger trading range, it is impossible to confirm for certain that wave 4 is indeed complete. Nevertheless, unless the S&P drops back below 2,700 (and the May 29 low), we will assume that a low is in. Additional support worth watching is around 2,740. At the same time last year, the S&P 500 was in the early stages of a 270-point drop and logged one of the worst Januaries in history. The chart below plots the S&P 500 against six different investor sentiment gauges. 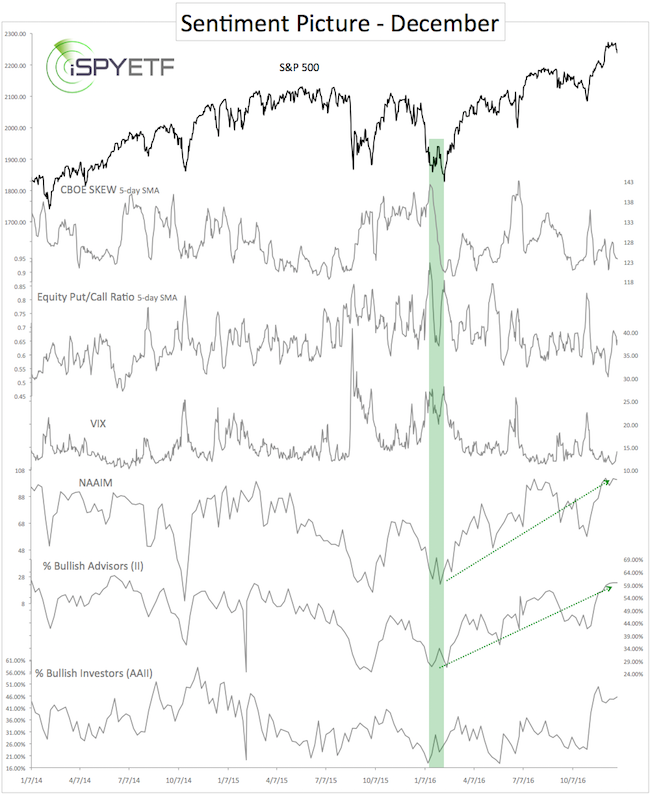 Sentiment has gone from extremely bearish in January/February 2016 (green bar) to extremely bullish today. Here is the elephant in the room: From a contrarian perspective, is investor sentiment bullish enough to cause a significant drop right now? When viewed in isolation, the answer is: Yes. By some measures, today’s sentiment extremes rival extremes seen in late 2007 (December 31 Profit Radar Report includes a comparison between investor sentiment in 2007 and 2016). 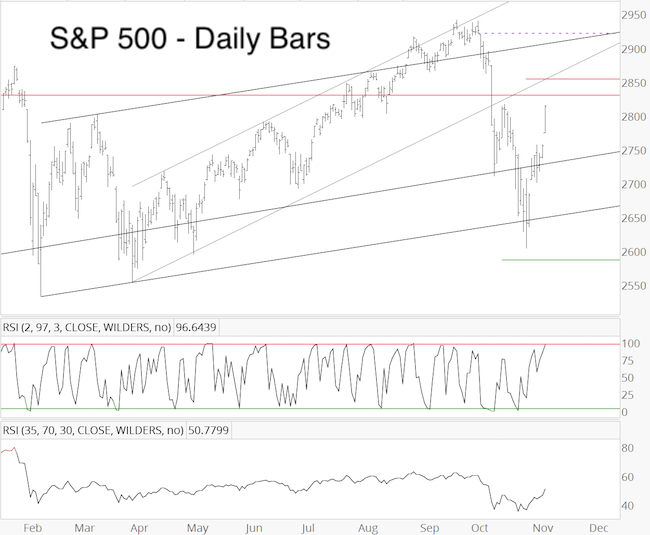 We never rely on any one single indicator, and other indicators – which predicted this rally before it started – continue to point higher (our longer-term bullish indicators were discussed here: S&P 500 – Expect the ‘Abnormal’ – Comprehensive S&P 500 Analysis). 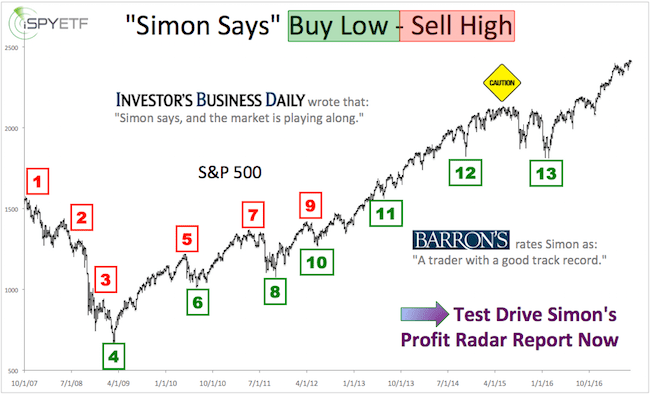 The S&P 500 has yet to reach the up side target published by the August 5 Profit Radar Report (see chart below). There are times where stocks continue to climb despite sentiment extremes. Now may be such a time. After three weeks of choppy trading, the market did what it does best. It fooled the crowd by briefly dropping below the 20-day SMA and double trend line support at 2,245. Continuous updates with actual buy/sell recommendation are available via the Profit Radar Report.